Though the weekend after Thanksgiving has traditionally been the "Weekend That Hollywood Forgot," this custom has started to change. A-List (or at least, just shy of A-list) movies have slowly dared to take it on, treading gingerly onto the thin December ice. One such film is Analyze That, the sole high-profile film to launch in wide release this weekend, and is the first sequel to attempt a release in this particular weekend since Star Trek VI: The Undiscovered Country did it in 1991. Two other films launch in medium release but a major Oscar contender arrives in limited release and has the potential to be a bigger story than either one . What if they made a sequel and nobody cared? What if "nobody" referred to the people making it? That's the impression one gets from the Analyze That campaign, one of the more aggressively unfunny looking films in some time. 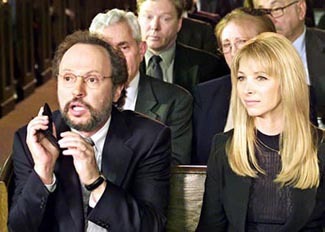 Its predecessor, Analyze This, was a rather significant film because it revitalized Billy Crystal's career after a long string of flops, and also because it introduced Robert DeNiro, comedian, to the world. Without Analyze This's surprising success ($106.7 million total), there would be no Meet the Parents (there would also be no Showtime, but it's probably best if it didn't take credit for that). Unfortunately, DeNiro appears to be reading is own press about how funny he is. DeNiro crying the first time is funny. The second time, not so much, mostly because he expects us to laugh, like the slathering dogs that we are. You'd almost swear this was a slapped together cash-in sequel, but they've had three years to get it together. Why does it look so terrible? Though the writer is the most neglected man in Hollywood, the big difference here is the departure of screenwriter Kenneth Lonergan, the Oscar-nominated scribe of You Can Count On Me, who has been replaced in the three-man team that includes director Harold Ramis and Peter Tolan with Peter Steinfeld, whose biggest credit before this was the dark comedy flop Drowning Mona. We're not talking about the most inspiring choice here. Still, with a recognizable name brand and all major cast members returning, it seems very likely that Analyze That will be able to top the original's opening weekend, if not its leggy post-opening frames. Opening at a medium-wide 2,635 venues, Analyze That ought to intimidate about $24 million out of the box office and should stake out a spot at the top of the box office. A different kind of gangster film is Empire, featuring the talented but low-watt star of John Leguizamo. Kind of a Death Wish in reverse, Empire has him as a small time criminal looking to make a big score with a "legit" white businessman. Since you can just never trust Whitey, he of course gets ripped off and has to make a war to get his money (and respect) back. While it comes off fairly clichéd, it actually looks fairly entertaining for fans of the genre. A Hispanic take on what has traditionally been a genre for "Black" films, Empire is a unique product in the marketplace. It's also going to be one that's difficult to find, starting in just 864 locations. This will probably limit it to just $4 million or so at the box office. Also finding a home after a few weeks of shuffling around the bottom rung of the release schedule is Equilibrium, a low-budget sci-fi film (in the sense of Solaris more than Men in Black) from Dimension, Miramax's genre wing. Appearing to be nothing less than a cross between 1984 and Fahrenheit 451 infused with the action stylings of The Matrix, it's a wonder this is getting released in only 301 venues. It's less of a wonder when looking at the cast, headlined by Christian Bale and Taye Diggs (although Bale was a headliner in this summer's Reign of Fire, which opened well enough for what it was). If Equilibrium starred, to pick a not so random actor, Keanu Reeves, it would be a tentpole summer action film. With a low cast budget, it's instead abandoned to a tiny release. Sci-fi does particularly poorly in this kind of atmosphere and though the trailer is wonderful, the lack of promotion will likely put it below $1 million for this weekend. Though it starts on just seven screens, Adaptation is potentially the biggest new film in the long run, with Oscar hopes galore. The second of three Charlie "Being John Malkovich" Kaufman scripts to hit theaters this year, it's difficult for me to talk rationally about the film, since it's quite nearly the film most directly attuned to my sensibilities. Self-referential films about the creative process will always get my full attention, especially from a writer as inventive as Kaufman. Luckily, he's also got Spike Jonze back directing his script and in a stunning upset, I'm also glad Nicolas Cage is playing the lead role in the film, though it's more a case where I'm glad to see him back doing "real" acting, instead of the paycheck roles that he's put in for most of the last five years. A highly elliptical adaptation of Susan Orlean novel The Orchid Thief (itself rather impenetrable), Adaptation is as much about Kaufman's own attempt to adapt the novel as it is about the story in the novel itself. Not only is he the main character in his own script, but Kaufman has also written in a fictitious twin brother (who also has a screenplay credit! ), representing something of an alter ego (or more accurately, id). Additionally, the novelist Orlean is also in the movie, played by permanent Oscar contender Meryl Streep. Clearly, Kaufman and Jonze are nearly incapable of approaching things in a standard way. Watch for Adaptation to start out with about $300,000 and build towards a wide release. It should be helped along by the end of year award societies as they arrive; the National Board of Review named Chris Cooper its Best Supporting Actor in addition to giving Kaufman Screenwriter of the Year honors. Watch for those last kudos be repeated several times. Call them the co-number one films of last week; Harry Potter and James Bond both were able to claim wins over the Thanksgiving holiday, with Potter taking more in the Friday to Sunday period but Bond having a higher five-day total. Franchise records are at stake for both films as they attempt to last into the Christmas holiday period. Both crossed significant milestones as well, with Chamber of Secrets crossing $200 million in 17 days (two behind Sorcerer's Stone) and Die Another Day making $100 million in ten days (a franchise record). Aided in no small part by the family-friendly weekend, Potter recovered nicely from an initial free-fall to drop just 24%. This feat, of course, won't be repeated, as Chamber of Secrets won't have that massive Friday box office to lean on again. Drops of over 50%, even from the three-day figures, are basically assured, just from the nature of the weekend. Both Chamber of Secrets and Die Another Day should wind up at around or below the $15 million mark, still healthy figures for both. The Santa Clause 2 was the biggest winner of all over last weekend, though, increasing its take from $10 to $12 million. The film now appears to have an excellent chance to pass the original's $140 million, though the inflation-adjusted $200 million plus is probably still out of reach. Still, with the Christmas season coming, anything is possible. Stranger things have happened. Disney's other current family release, Treasure Planet, will have to hope for similar holiday cheer after opening with only $12 million. All is not lost, though, considering the performance of The Emperor's New Groove, which managed only $9 million and change on its December 2000 release weekend but nonetheless managed to gross $88 million in the final total. A box office take akin to Disney's other releases like Lilo & Stitch is almost assuredly out of the question. The other four releases from last weekend are unlikely to be so lucky, especially the audience-reviled Solaris. Not deserving of the straight F result from Cinemascore, the film faces an actively hostile response and may not stay in theaters through the Christmas week. Adam Sandler's 8 Crazy Nights has less of a problem in this sense because of lowered expectations, but it's still not a very good movie and has possibly run out of die-hard Sandler fans to see the film. Wes Craven Presents: They and Extreme Ops are set to be the very definitions of "one-and-dones."